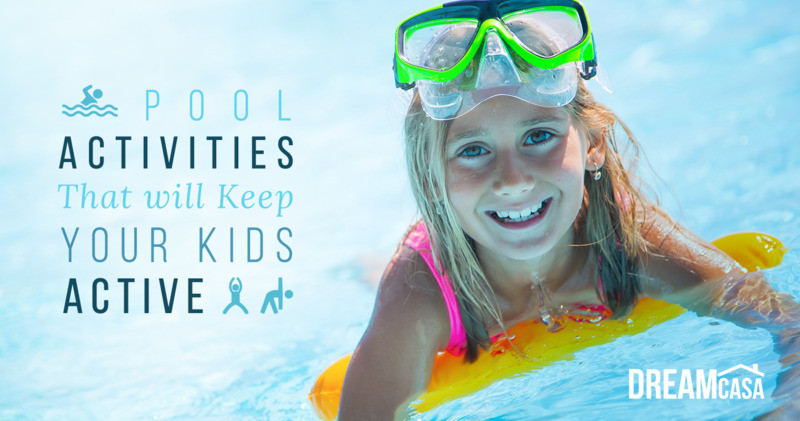 Pool activities vary in all shapes and sizes, but they are not what one thinks about when initially purchasing a pool. Hot weather is probably the first consideration. From child to parent, everyone’s thinking the same thing when they’re trying to enjoy a sweltering day in their backyard: ‘I wish I had a pool’. Having the ability to just dip in for a minute every so often to cool down, is the difference between retreating to the air conditioning and enjoying summer to its fullest. Another reason is keeping your kids outside and active instead of cooped up in the house. When spring fever wears off, in these technologically advanced days, the tendency is for children to stay inside if it’s too warm and play video games, watch TV or a variety of other screen centered activities. Once you do finally install a pool, your issues are not over yet. Children get very excited and can be reckless around the pool, especially in larger parties (which there’ll be more of once word gets out you have a pool). Take charge and organize some of the activities outlined and ensure that your children and guests are active and stimulated. Sharks and minnows is a game fun for all ages. It consists of designating a shark who stands in the middle of the pool. Everyone else is a minnow and must be touching the side of the pool in order to be immune to the shark’s attacks. The object of the game is to engage the shark by timing a swim across to the other side. If the shark catches you; you switch and you become the shark, a play on tag. Divide the crowd into two teams and line them up on opposing sides of the pool, then a place a bucket on each end. Dump a giant bucket of ping balls into the centre of the pool, then shout ‘GO’. The swimmers must then collect as many balls as possible and place them in the opposing bucket. When all the balls are gone, the team with most balls in their bucket wins. In an every person for themselves style game; sprinkle a bunch of change in different sections of the pool, then shout ‘GO’. The object of the game is to dive for as much change as possible in an endurance test. Whoever retrieves the most change, wins. In a game of attrition, choose one player as the ‘whacker’ and everyone else must submerge underwater. When players inevitably ‘bob’ up for air, the ‘whacker’ must attempt to whack their head with a pool noodle; once whacked, they’re out. Who ever survives, takes over as ‘whacker’. The person with the strongest lungs and best strategy has the best advantage. In this activity, line everyone in a circle inside the pool, along the outer edge. First start by walking in line around the perimeter, followed by speed walking, followed by jogging, and finally running. This will cause a cyclone to form in the pool that will eventually carry you. Once it’s carrying you at full force, the best part is getting everyone to reverse at the same time. Don’t have a place for your kids to swim? Check out the cost of buying a pool and the many other benefits.